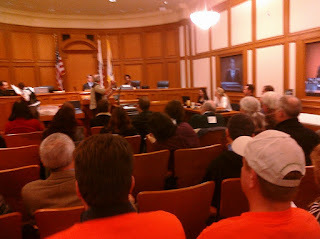 Chaired by Supervisor Mirkarimi. Standing Room Only. First up a guest appearance by SF Garter snake, presented by a caretaker from the SF Zoo. Pretty cool. I understand that this is being broadcast live on SFGOVTV.org. As always, I am not sure how well the live blogging will work out, but will give it a shot. I am also preparing for my one minute of Public comment. The pressure is intense. And I am under-caffeinated.